The girls and I are getting ready to head home for graduation weekend. I have three nephews ready to meet the next phases of their lives. The little guy just graduated Pre-K and the two older (ages 18 and 19) are graduating high school and ready to face the world. I was just 17 years old when I graduated high school and I naively thought everything in life was going to be easier than it is. I knew there would be struggles, but I had no idea the lessons I would learn and the difficulties I’d encounter to learn them. My nephews (and my nieces) are my first kids. Watching them grow up has been a joyful experience I am so thankful to be blessed with. I want to protect them from the evils of this world. But, I can’t. 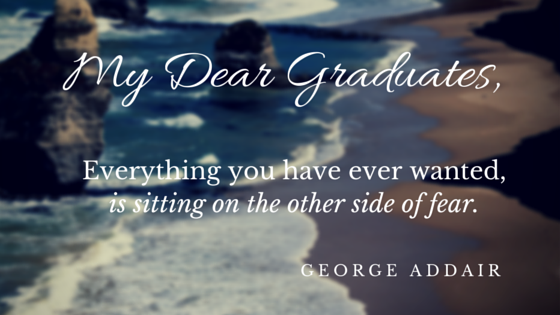 So, I hope sharing these small words of wisdom on their graduation day will help them along the way. 1. Always Be kind. To everyone you meet. Not only is it the right thing to do, but one day you will find yourself in a position where you need someone’s kindness. Treat other’s the way you want to be treated in any situation, and always show compassion. 3. Never Be Afraid of Hard Work. Nothing in life is handed to us. If you want more from life don’t be afraid to start at the bottom and work your way to the top. It will feel difficult and sometimes pointless, but just keep working. One day all that hard work and struggle will be rewarded. 4. Remember To Rest As Much As You Work. We spend most of our young adult life working hard and chasing new opportunities. Take time to make a memory, soak in a sunset, remember the feeling of holding someone’s hand, or remember how the ocean smells. These memories will carry you through the struggles in life (and one day old age). 5. No Matter Where You Go, Just Be You. Don’t change yourself to impress other people. You are who you are (and that is enough). If you have to work to get someone to like you or notice you then the relationship isn’t genuine. You will find greater quality relationships by first accepting yourself. 6. Money Is Not Everything. Money is important to paying the bills, but it is not what you build your life on. Pursuing money above love will only bring you loneliness and heartache. May you always have enough to be comfortable, and just enough extra to buy a few luxuries. 7. Never Be Afraid To Be Generous. Give away your money, open your heart, volunteer your skills, lend out your things even if they never come back. The energy and love you put out into this world will always come back to you. If you are generous life will be generous to you. If you are stingy life will treat you the same. 8. Make Safe Choices. Sometimes it’s easy to go with the flow and just follow the crowd. You may find yourself ready to do something that goes against your instincts. It’s OK to say no and make the choice that feels right to you. 9. Take Care of Your Body. Eat nourishing food, give yourself plenty of rest and take good care of it. One day you will need it to take care of you. 10. Always Look Before You Sit. This piece of advice was delivered to me on my graduation day and I still live by it. Nothing ruins your day, or your mood, faster than sitting in something sticky or messy. Always remember this: Always. No matter where you go in life, no matter what job you have, who you marry, no matter what religion you choose (or don’t choose); even if you chose to change your body, I will always love you. Always. Congratulations graduates! Go make yourselves proud and build the life you were meant to live and enjoy every single moment of it! Love your tips – especially the looking where you sit! The world always looks so bright on graduation day! I love #10, it’s a good rule to live by! My brother-in-law just graduated high school too and I remember graduating myself just like it was yesterday! It’s such a scary and exciting time and a little advice can make all the difference!